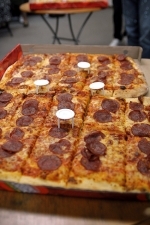 We had indoor event for Pizza Pizza Party with about more than 30 Maple students who are in all different shcool. The Party was all standing party. We ordered 9 pizza party tray. It was Pepperoni, Hawaiian and Mushroom for 3 each. We greeted and talked to one another and shared about school life and a useful information. We all enjoyed and had really fun time with taking pictures. We were all full and we gave out all left over pizzas to poor students. :-) We had a great and wonderful day.